Whether you're planning a trip to the beach, a day at the lakes, or enjoying the pool in your own back yard, these emoji beach balls will keep you entertained for hours! 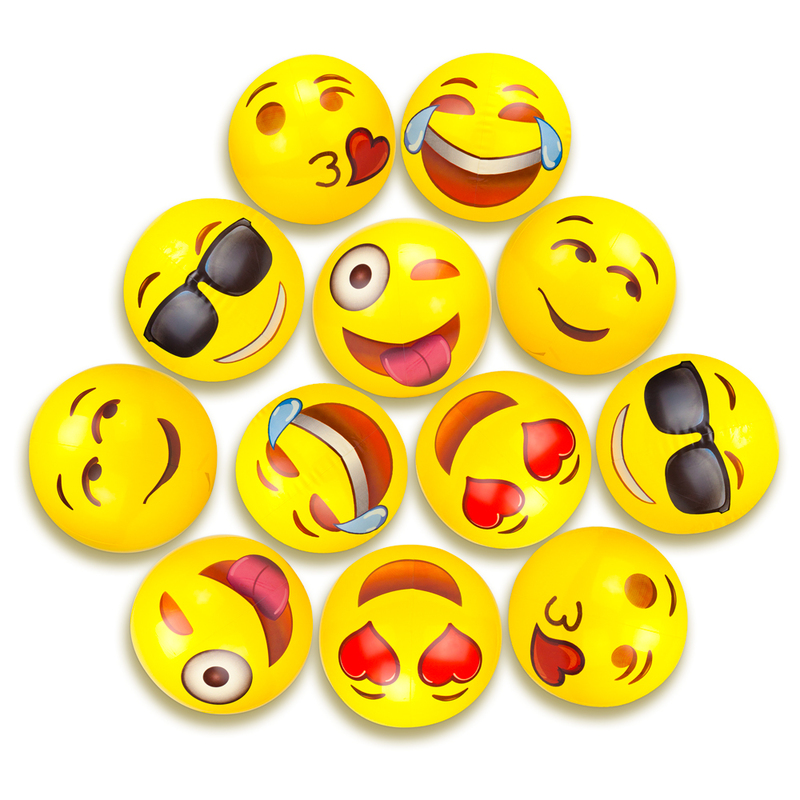 The set includes 12 beach balls, each with a variety of emoticon facial expressions. Made from vinyl, these fun faces have a standard air sprout, making them easy to inflate by mouth, hand pump or pressure pump. Measuring 12 inches, they are sure to be a crowd pleaser for party favors, gifts, summer camps, or vacations. Lay out your towel, plant the umbrella, breathe in the ocean air, and feel the sand crunch between your toes. The only thing missing from this picture? The beach ball! 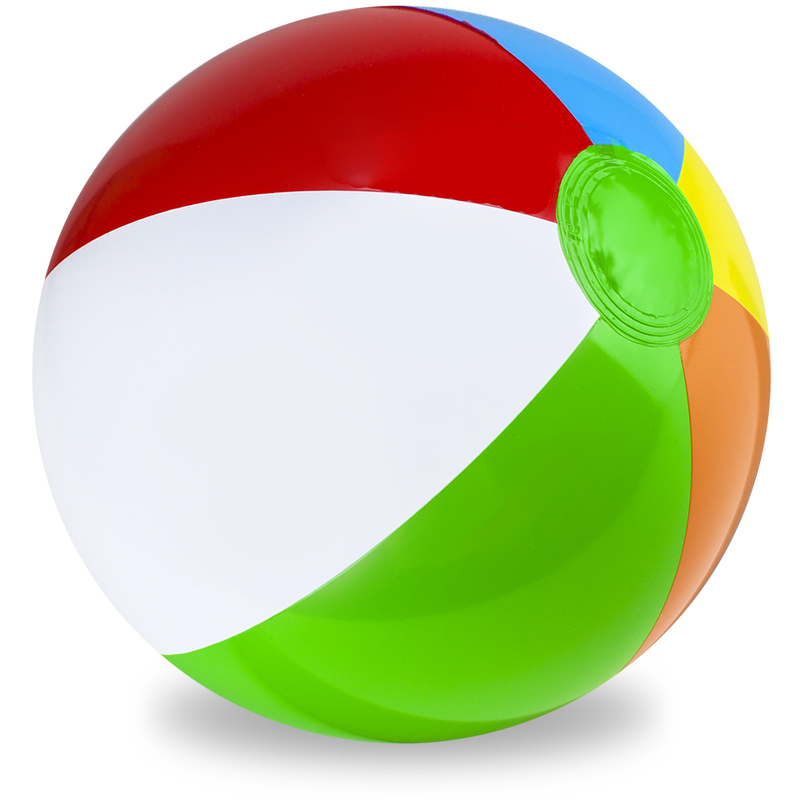 The perfect seaside toys since their invention in 1938, beach balls were originally about the size of a hand, but we've pumped up the size and pumped up the fun with our classic, six-color beach balls. Why You'll Love It: Available in two sizes, 12" and 16", our beach balls are made with tough, durable vinyl with reinforced seams that stand up to a whole summer of play. Just pop out the valve, blow up the ball, and tuck the valve right back in! Each ball arrives deflated and unstretched. After your first inflation, allow the vinyl to expand, then top it off. The balls will hold a single inflation for weeks! Our beach balls are measured from pole to pole after inflation. 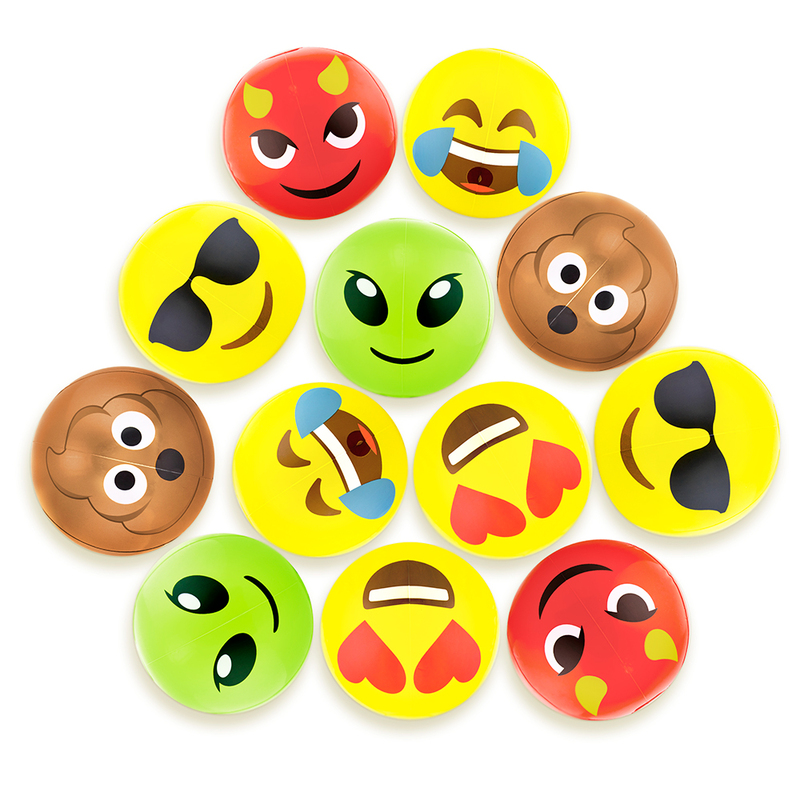 Whether you're planning a trip to the beach, a day at the lakes, or enjoying the pool in your own back yard, these emoji beach balls will keep you entertained for hours! The set includes six beach balls, each with a unique emoticon facial expression. Made from vinyl, these fun faces have a standard air sprout, making them easy to inflate by mouth, hand pump or pressure pump. Measuring 18 inches, they are sure to be a crowd pleaser for party favors, gifts, summer camps, or vacations. 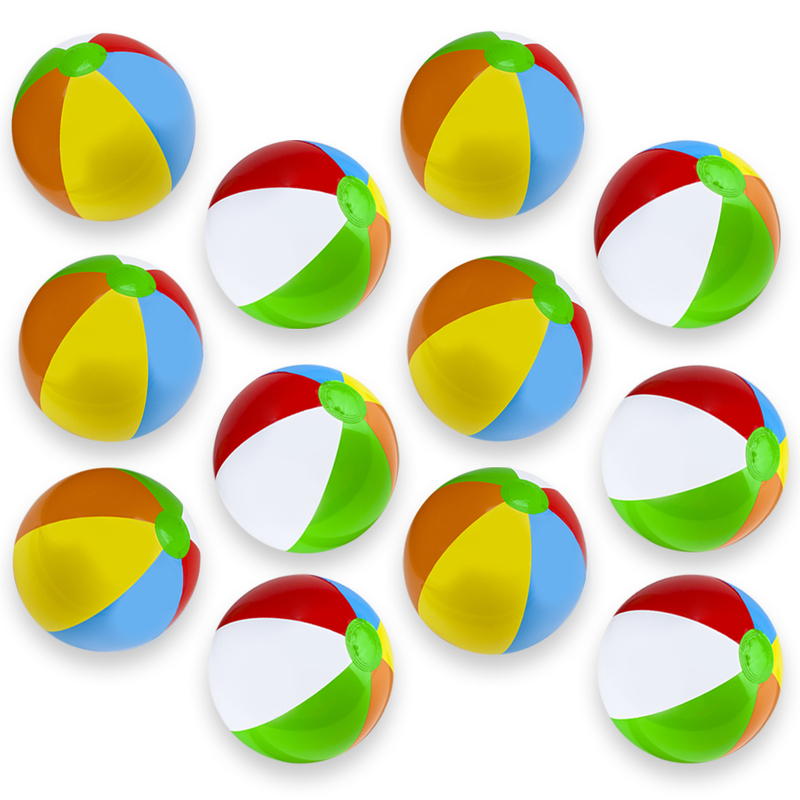 Get ready for your next trip to the beach with this 6-pack of fun emoji beach balls. 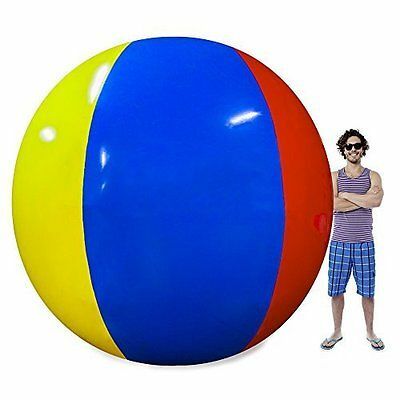 At 18 inches around, these blow up balls are great for volleyball, perfect for toddlers, or party favors, or fun pool toys. Make your favorite emoji your favorite new beach ball. 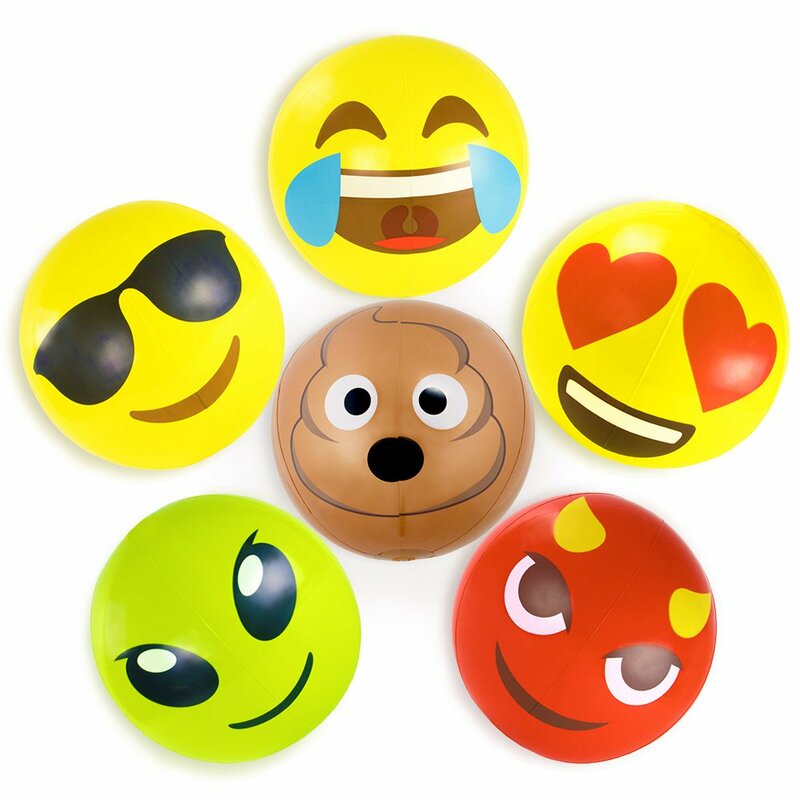 Each small deco inflatable ball sports the face of a cute emoji icon, like the Heart Eyes emoji, Devil emoji, Crying Laughing emoji, Sunglasses emoji, and the Poop emoji. Blow them up for photo booth fun at a pool party. Play volleyball in the water, or kick them around on the beach for some summer fun. 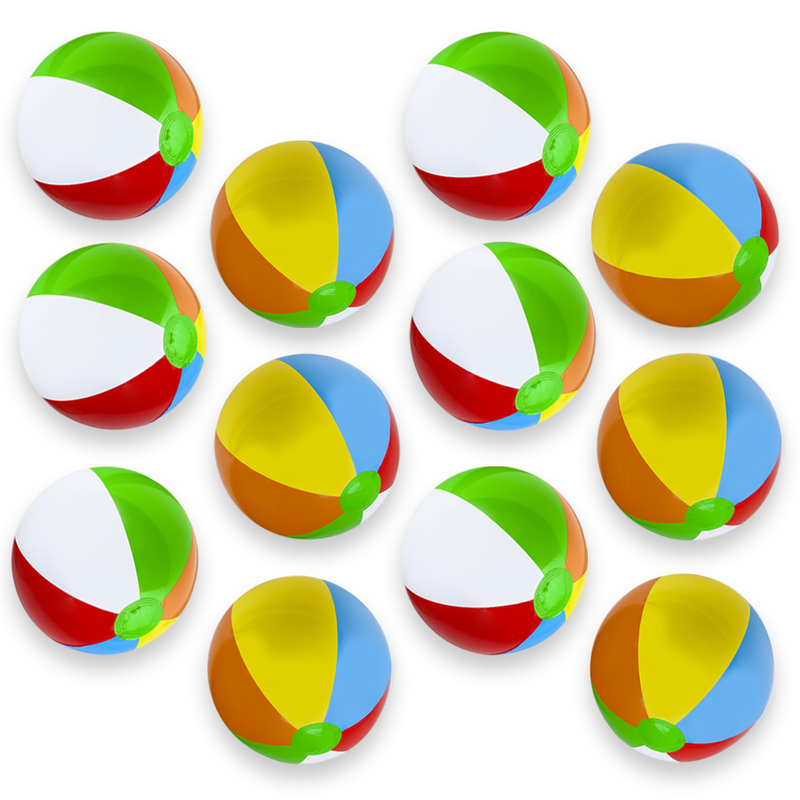 Made from durable and waterproof vinyl, these mini beach balls are made for beach and pool play. Don't worry about rough sand or concrete, these emoji beach ball toys are made to be played with. Check off party favors from your party supplies list, and give guests a cool and personalized mini beach toy at your next celebration. Let kids choose from their favorite emojis and colors for a gift that they will love. Kids and teens love having their favorite emoji symbols on their stuff. Get them away from their devices and out in the sunshine with these fun and familiar faces. Give them as a gift or simply bring them along on your next beach outing to entertain everyone: adults, toddlers, kids, and teen boys and girls. Each emoji face matches a symbol on your phone: alien emoji, crying laughing emoji, devil emoji, sunglasses emoji, and the infamous poop emoji. Gone are the smiley faces of the 60s. Emojis are today's hip symbols. Lay out your towel, plant the umbrella, breathe in the ocean air, and feel the sand crunch between your toes. The only thing missing from this picture? The beach ball! The perfect seaside toys since their invention in 1938, beach balls were originally about the size of a hand, but we've pumped up the size and pumped up the fun with our jumbo, six-color beach balls. Why You'll Love It: Available in two jumbo sizes, 24" and 36", our beach balls are made with tough, durable vinyl with reinforced seams that stand up to a whole summer of play. Just pop out the valve, blow up the ball, and tuck the valve right back in! Each ball arrives deflated and unstretched. After your first inflation, allow the vinyl to expand, then top it off. The ball will hold a single inflation for weeks! Life's a beach, so enjoy the waves! Have fun in the sun with these 18 colorful beach toys. Shovel some sand into the handy dump truck, moisten it with the water can, then mold it into all sorts of peachy beach shapes! Why You'll Love It: We've packed the Bodacious Beach Bum Activity Pack with all sorts of sensory experiences meant to engage creativity and motor-skills all at once! Kids get to feel the sand change from dry to wet, observe the changes in texture and shape, all while manipulating colorful, dexterity-developing tools. It's simple, classic fun with tons of lasting benefits. 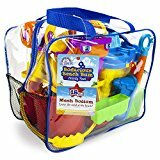 When playtime's over, simply pack up the toys in the handy carry case, give them a quick rinse, and watch all that pesky sand fall right out the quick-drying, mildew-resistant mesh. Sorry sand, but you're staying at the beach! Sometimes, with all the talk of sand, sun, and waves, people forget that the recipe for a perfect day at the beach is equal parts sun and shade. And nothing kills the good vibes quicker than an unstable, falling umbrella. But Sol Coastal has you covered. Meet our colorful family of sand anchors, made of hardy PVC plastic. 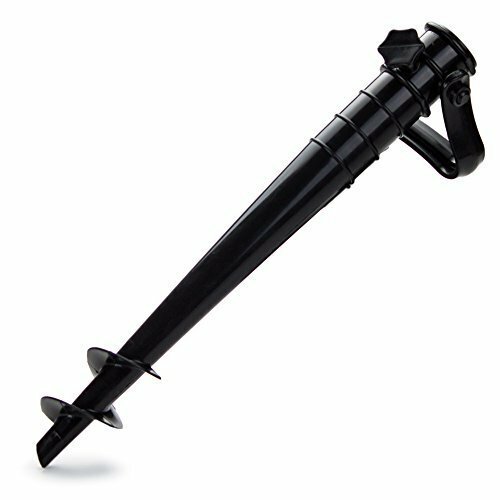 Drill the blades deep into sand and dirt and keep your umbrella upright, hanging tough against strong winds! Better yet, the adjustable sheath fits poles up to 1.25", or if you add our special thin pole grip, it snugly accommodates smaller poles up to 3/4". Why You'll Love It: Never babysit your umbrella again. Just dig in, turn the innovative thumbscrew to lock it in snug, then enjoy your day. Your umbrella stays upright and completely carefree! 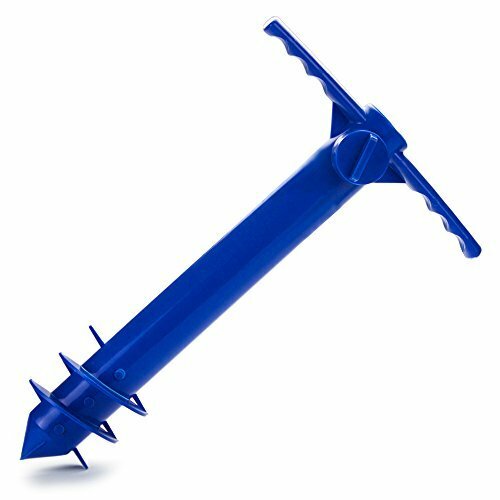 And, because it's made of sturdy PVC plastic, this sand anchor will never rust in the humid, salty sea air like metal anchors. Weighing a scant quarter-pound and measuring just 16.5" tall and 3.75" wide, it's easy to take it anywhere and everywhere you need it. Beat the heat in style with this light and breezy bohemian poncho from Sol Coastal! Made of soft, lightweight, and sheer Rayon, this flowy, billowy piece keeps you cool and covered in bright sunlight. Slipping on and off in a blink, it's an effortless, relaxed addition to any wardrobe. Why You'll Love It: Measuring 27" from neck to hem, this one-size-fits-all wonder makes a great top for tall women, or a flirty coverup for petite frames. Available in two bright, beachy colors: Mint Raspberry and Blueberries & Cream.